My daughter spent a semester in Europe recently and took some really spectacular photos â€” landscapes, famous monuments, cathedrals, her feet. And most of her food. 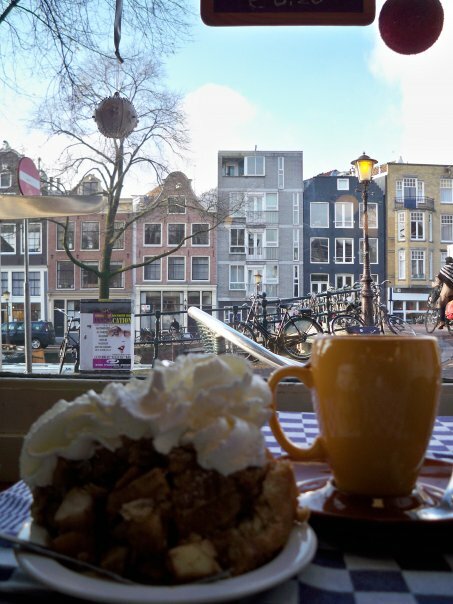 A gorgeous photo of her lunch in Amsterdam â€” apple tart and cocoa. Best. Potato. Ever. Coupled with a hefty scone, tea and the most intense clotted cream ever. Chili and rice in Windsor. Irn Bru and a Scottish sandwich. It was pizza, Firefly tea and Cadburyâ€™s. The Breakfast of Champions. Word is, the tea was unremarkable. But it was called Firefly (her favorite tv show)! Coleslaw/cheddar sandwich, firecracker lobster chips, blackcurrant juice, and a Mars bar. Her friends went all out for her birthday party. 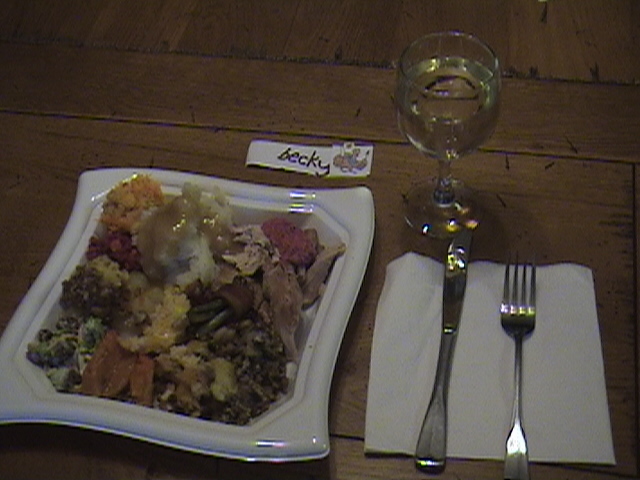 As an homage to her, and because she was absent, I took a photo of my plate at Thanksgiving. Whatâ€™s your favorite Food From Another Land? This entry was posted in Goofy Stuff and tagged Amsterdam, apple tart, Becky Clark, Cadbury's, firecracker lobster chips, fish and chips, food, haggis, Irn Bru, photos, Scotland, Thanksgiving dinner on January 14, 2009 by Becky. Moussaka. My Dad learned to make it the traditional Greek way, and even when I was a picky teenager I LOVED it. I don’t even know what Moussaka is, but I love going to the Greek Festival here in Denver and stuffing my face with all kinds of other Greek goodies … so I bet I’d like it too! Empanadas … simply the best!!! Now I just need to go to Argentina and have them there. Moussaka is oven-baked eggplant with ground lamb, greek spices, topped with bechamel sauce. I love the sambusa (also called “samosa,” depending on the country), which is a little turnover filled with potato, or lentils, or meat. Moussaka, empanadas and sambusa … Bring ’em on! Sounds much more interesting than the pbj I just had.